A photographic project to examine the societies in both countries. Three Malaysian and three Australian photographers journeyed to each other’s countries for ten days with a brief to record the ways in which multiculturalism manifested itself there. The result was an exhibition of about 85 photographs which travelled to four cities each in Malaysia and Australia in 1996–1997. It added to the prevailing debate on multiculturalism in Australia and the repercussions of Australia’s management of its relations with Asia. Body tattoo unites the two individuals on the cover of the book. 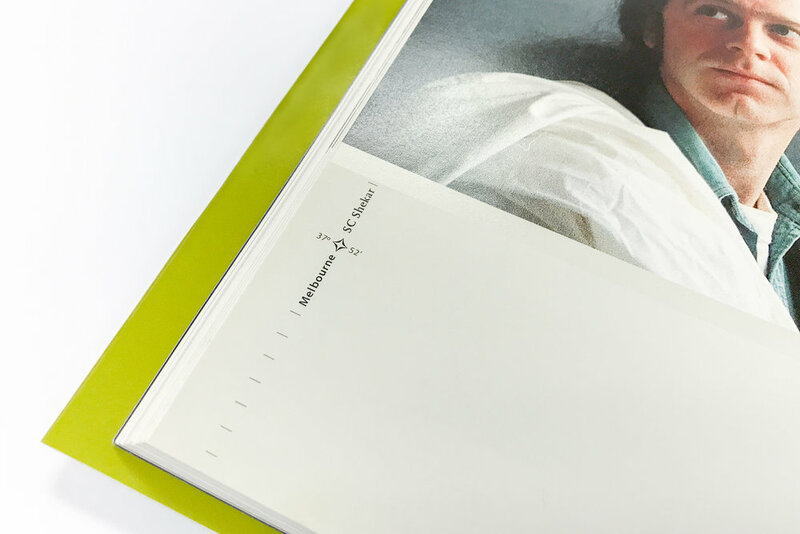 The introduction of the book incorporated a film-like effect, where some images are designed to spill over to the next page, implying a continuation from one page to the next. This was done to illustrate the emotions of the photographers involved in this project, who shared with us that the entire journey felt like a constant state of being on-the-go, always rushing from one point to another. Another unique feature of the book layout is the incorporation of geographic tools: scale-to-scale comparisons as well as the geographic coordinate system (latitude and longitude). We featured a scale-to-scale comparison between Malaysia and Australia to illustrate the actual difference in size between these two countries, allowing readers to appreciate this fact. We also used the geographic coordinate system (printed along the edge of each page) to help annotate the exact location where each image was taken, as well as which photographer had taken the photo.